The winner of the GCM raffle ticket draw who won the $ 15,500 new car is Mrs. Viky Vardatsikos. 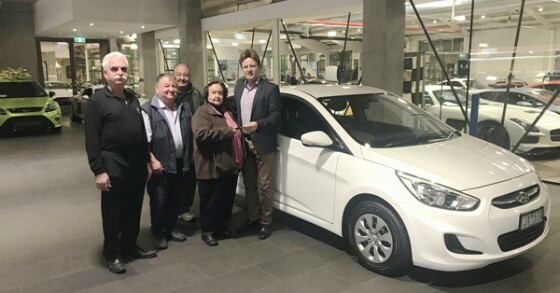 The keys of the new car were handed to Mrs Vardatsikos (above) on Monday 1 May, at the Dutton Garage (Ritchmond) of Mr. G. Nakas. Present were Hon General Secretary Costas Markos, Board Member Michael Karamitos who secured the first prize for GCM raffle and sponsors Arthur Salahas and Arthur Nakas. The first prize was also sponsored by businessmen and GCM's benefactors Steve Koukouvitakis and Greg Kaias.